A natural Reef can be characterized as an elevated hard surface on which sedentary or encrusting animals live, such as sponges, hydroids, anemones, and bryozoans; These animals increase the opportunities to catch plankton while minimizing the smothering effect of settling sediments. Most animals with sessile adult stages produce pelagic eggs and larva that live in the water column in order to distribute their offspring into areas suitable for colonization. Consequently, any new hard surfaces are quickly occupied. Mid water fish are often attracted to rocks or wrecks that give some shelter from tidal currents and predators, and increase feeding potentials. Such hard substratum sometimes contain crevices that can also provide shelter for crabs and lobster. Rocks on reef offer valuable sediment sites for seaweed and invertebrates, and shelter for mobile bottom dwelling forms and fish, so providing additional feeding opportunities for many animals. Any extension of such a habitat, construction of an artificial reef, increases the quantity of animals able to live within a given area of seabed. Sedimentation: Construction along coasts, inshore construction, mining or farming upstream, or logging in tropical forests causes soil to erode and rush downstream into the ocean and onto coral reefs. This dirt, silt, or sand can make the water cloudy or muddy, smothering the coral which can't get enough light to survive. Mangrove trees and sea-grasses which normally act as filters for sediment are also being rapidly destroyed. This has led to an increase in the amount of sediment which reaches coral reefs. Mangrove forests are often cut for firewood or removed to create open beaches. They are also destroyed by prawn harvesters to open up areas to create artificial prawn farms. Fishing with Explosives: Over-fished reefs and desperate fishermen produce a deadly combination when reefs are dynamited to harvest small fish. Fisherman prepare bombs made out of materials such as potassium nitrate (a common fertilizer) to cause large explosions which kill all the fish in the surrounding area and reduce nearby coral to lifeless rubble. Cyanide Fishing: Commercial fishing fleets often use cyanide and other poisons to stun and capture valuable reef fish. This method is often used to catch tropical fish for aquariums and is now used to capture fish for "live fish" restaurants. This fishing technique poisons not only the fish, but the coral polyps and other creatures in the area as well. In the Philippines, up to 200E6 kg of cyanide are sprayed and dumped onto the reefs each year � with the net result that less than 10% of the coral reefs in this area remain healthy. Collection and Dredging: Removing coral to be used for construction material or sold as souvenirs also threatens coral reefs (Sri Lanka and the Philippines). Water pollution: Petroleum products and other chemicals dumped near coastal waters eventually find their way to the reefs. Oil and gas leaked or spilled near a coral reef poison coral polyps and other marine life. Trash dumped into the water can also kill coral reef life. Plastic bags get caught in the stomachs of turtles (mistake them for jellyfish) and fish, causing them to starve to death. 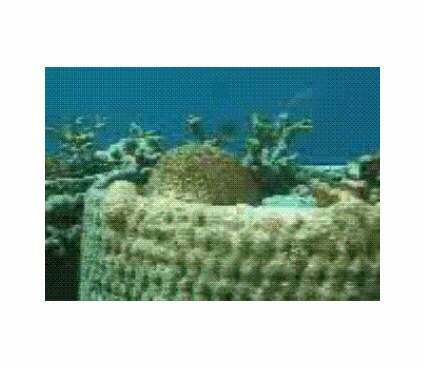 Trash can also cover coral reefs, blocking off the sunlight needed to keep the reefs alive. Lost or discarded fishing nets - called "ghost nets" - can snag on reefs and strangle to death thousands of fish that get caught in them. Human Run-off: Fertilizers and sewage dumped into coastal waters encourage rapid algae growth which chokes coral polyps, cutting off their supply of light and oxygen. Over-fishing makes this problem even worse because the fish that would normally eat the algae have been captured and killed. Careless recreation: Careless boating, diving, fishing, and other recreational uses of coral reef areas can cause damage to coral reefs. Dropping anchors onto reefs can crush or break coral. When people grab, kick, walk on, or collect coral, they also contribute to coral reef destruction. Global warming: Coral reefs are also threatened by global warming. There has been an unprecedented increase in the number of coral bleaching events during the past 2 decades (which have had some of the warmest years in history). When ocean temperatures get too high, coral polyps lose the symbiotic algae inside them, causing them to turn white, or "bleach," and eventually die. Global warming trends may also lead to more extreme and unpredictable weather. An increase in tropical Storms could do extensive physical damage to coral reef ecosystems. Rising sea levels may become a serious threat to coral reefs and to small island nations based on coral reef atolls. For the reasons explained before, artificial reefs have potentials as a positive management tool that can be used to allow the stressed natural site to recover, and to develop quality fishing grounds close to access points. With the concomitant beneficial effects for recreational divers, anglers and the economies of local communities by increasing stock sizes of reef fishes as well as enlarging overall population numbers of species present in a particular area. Is there a difference between an artificial and a natural reef? Reefs no simple things from stone and rock separate living structures. Corals are the only organisms, which build themselves their foundation and that the following generations. 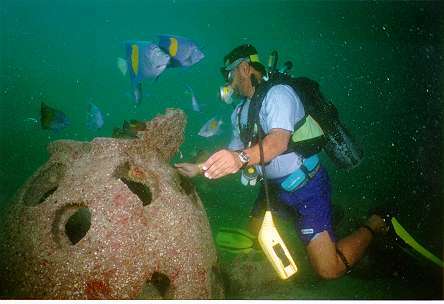 What is an artificial reef? Artificial reefs are man-made or natural objects placed in selected areas of the marine environment to provide or improve solid and rough bottom habitat and thereby increase the productivity and harvestability of certain fish valuable to man. Most exploitable fishes inhabit the continental shelves, but much of the shelf area consists of unproductive sand or mud bottom. Coral reefs and rock outcrops are desirable recreational fish sites, but are found only in limited areas along most coasts. Artificial Reefs provide shelter, calm waters, influence water currents so that fish save energy while swimming against the current. Attract smaller organisms which are vital sources of Food for different marine species. They also serve as visual reference points for fish that forage away from the reef and increase the all over reef area which can host a larger number of reef fish. These reefs, if properly constructed and properly buoyed, can be used to enhance existing rough bottom habitat, develop quality fishing ground close to access areas. Development of aquaculture along with the constructions of artificial reefs, helps in fisheries management, to enhance the wild population in aquaculture systems. In short, the development of environmental friendly alternatives as well as the potential of artificial reefs favors the epifauna filter-feeding community to act as biofilters; enlarge and allow rehabilitation of stressed natural habitats, and quantitatively boosts many marine species. Although artificial reefs usually do not have that many negative impacts, they can cause troubles if poorly designed and mounted. Insufficiently weighted materials which end up miles away from the reef site by strong winter storm (such as tires, etc.) can damage sedentary organisms of nearby natural reef sites and play havoc with the nets of commercial fisherman�s bottom trawl. Inadequate buoys and buoy chains, lost buoys, increase the amount of materials dumped into the sea, interfere with shipping or mineral development, apart being difficult to find. Use of toxic materials that pollute the aquatic environment (benzene-, heavy metals containing substrate) increase the already huge antropogenic impact. Artificial reefs are not marked so fishing or other vessels can�t avoid them. The majority of they have been built by artisan fishermen in tropical countries. The purpose of such a reef is to increase catches in local fishing grounds using simple, readily available materials like rocks, trees, bamboo, scrap tires, etc. The Japanese are the world leaders in artificial reef technology for commercial fishery enhancement and have been creating artificial reefs since the 18th century; the materials used are of high quality like concrete, steel and glass-reinforced plastic. 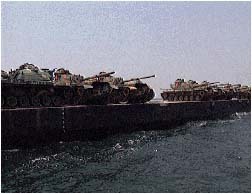 In the USA, the artificial reef programs of many maritime states are run for the benefit of recreational sports fishing, (SCUBA) diving, commercial fishing, waste disposal, and environmental mitigation; the materials used are mostly waste, including: concrete, rock, construction rubble, scrap tires, cars, railway carriages and ships. Only Japan and the USA have a national development plan. Malaysia and the Philippines use waste tires to build many of their artificial reefs. The central Visayan Islands of the Philippines have known to use 1600 pyramid bamboo modules. Australian reefs have been built from materials of opportunity such as tires and redundant ships; these reefs are used primarily as a focus for recreational angling, and SCUBA diving. In Taiwan many fishing vessels (made absolete by government policy to reduce the size of the fishing fleet) were sunk to provide new habitats. 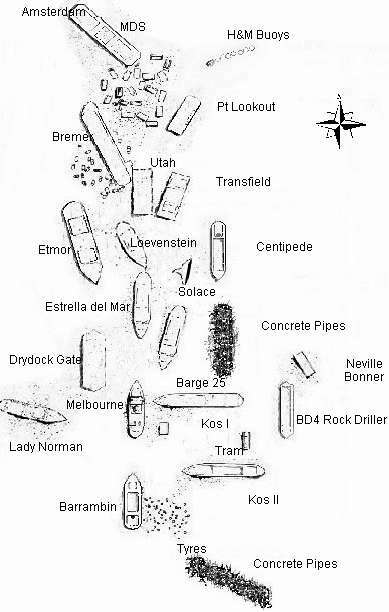 In Europe artificial reefs were pioneered along the Mediterranean coast in the late 1960�s. At present, most reefs are still associated with scientific research. Italy, France and Spain have been the most active reef building countries since 1970. Spain is placing more artificial reefs into its coastal waters than other EU country. In 1991, Italian artificial reef scientists for the 1st time formed an inter-European reef group to encourage liaison between research groups and other association of the Mediterranean. 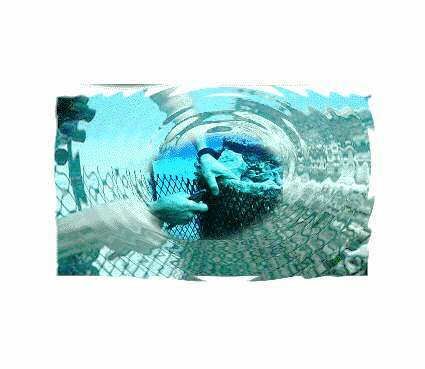 Current initiatives include a network of European artificial-reef research to establish a coordinated direction for artificial reefs within the EU. Comprehensive planning is essential to a successful reef-building effort. Materials, reef location, buoys, permits, assembly area, labor, financing, transportation and possible conflicts of interest must be carefully considered at the beginning of each project. Solutions of these considerations are best worked out by a committee representing local and State governments, State and Federal fishery biologists, sport and commercial fishermen, tourism board, and interested individuals. A test series in the bay of Tensing Pen (Jamaica) is the largest research lab for artificial reefs. At present scientists operate on a procedure to let artificial reefs grow by a type electrolysis. A power DC source connected via long cables are attached at the artificial reef, usually constituting a simple metal lattice construction. The current causes that calcium-carbonate (lime) separated from the sea water settles on it and laminates the lattice, which is immediately followed by a natural settlement of corals. At the anode, the positive pole oxygen and chlorine are separated, enriched at the negative pole, the cathode, calcium carbonate and magnesium - a new corral reef can develop. The current comes in this separated area from solar cells. Coral growth achieved by the new method not only is faster but result also in more resistant colonies. The corals prosper even with bad water quality, if natural reefs already die. The most interesting discovery of the scientists was however the effect of weak current on the polyps themselves. They current led directly to diseased corals resulted in a quick recovery of already bleached stocks within only few days. This new technique uses for the first time the almost unlimited occurrence of dissolved minerals in the sea. If one wants to deposit these minerals on the metal lattice, one needs only current - for example from solar power. Meanwhile, also the industry is beginning to show interests for this new method. First industrial applications included the construction of breakwater systems in tropical regions to protect the shorelines, dock areas, and harbor sites. 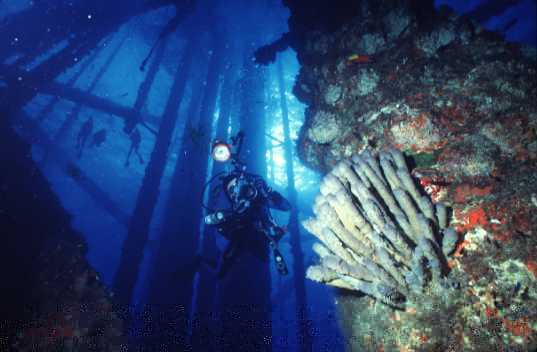 Almost every type of scrap or discarded object has been used to construct reefs. No, they collapse even sooner from wave surge and destruction by marine borers. Availability, cost assembling, handling, transportation, environmental effects (harmful effects from gasoline, heavy metals and other pollutants), conservation of resources (recyclable metals as iron, steel). The following factors should be considered: purpose, access, type of bottom, locations of wrecks, bottom irregularities, current and wave action, bottom depth, clearance above reef, and interests of other water users. The types of fisheries desired will greatly influence the design and location of a reef. demersal (benthic) species such as sea basses, groupers, snappers, crabs, lobsters, flounders, codfishes, tautog, rockfishes, sheepshead, seatrouts, croaker, black drum, porgies, grunts, groupers. effective for both demersal and pelagic species. Artificial reefs should be within easy and safe access of recreational visitors and / or fishermen. The composition of the ocean bottom is an important factor that could affect the length of time a reef will remain productive. If the material sinks into the sediments or is covered by them, the reef loses its effectiveness. Information about bottom type and depth can be obtained with bottom sampling equipment, diver inspection, depth recorder, or sounding lead, information from National Ocean Survey charts, State fish and game agencies, local colleges and universities with marine science programs, commercial fishermen, or oil company geologists. Strong currents and wave action can undermine, cover with shifting sediment or scatter materials. Building reefs in areas of strong currents and very shallow depths should be avoided. Local oceanographers or marine geologists should be consulted for information about currents and wave action that might be encountered at a proposed reef site. Depth selection for artificial reefs is dependent upon navigational clearance and material stability. Lightweight reef materials should be used in deep water or in protected estuaries where the effect of waves and currents is not great. Heavy materials that will not move can be used in any depth. The Corps of Engineers and the Coast Guard require that no artificial reefs be placed in navigation channels or anchorages. Commercial fishermen must be allowed free access to historic fishing grounds. A reef place near a commercial fishing ground must be well marked so that fishing vessels can easily avoid it. A suitable site can usually be selected by consulting the various user groups of that area. Federal and many states governments require permits to build artificial reefs. A minimum of two buoys should be placed on the reef site prior to construction, so that together they will indicate the reef boundary; one will mark the reef location when the other is being renovated or replaced. Most of these buoys are made of tough, hard plastic filled with foam, making them very economical. Material should not be scatted over wide areas, but clumped with open spaces between clumps. Like in a cycle or square with a central opening less than 20m across. Japanese researches have found that small, low objects are best for promoting growth of shellfish and seaweed. Structures with many small holes and crevices are best for attracting invertebrates (shrimp, crab, lobster) and juvenile fishes. Higher, larger structures with numerous crevices are best for larger fishes. The Reef was started in 1968 by the Underwater Research Group of Queensland. Originally it began with the Amsterdam Barge in August of 1968, it only took twelve months for the species of fish jump from two to thirty six. Now the reef consists of 19 vessels and one tram, and a large diversity of fish, including giant Queensland Gropers, cod, kingfish, red emperor, trevally, sweetlip, bream, mackerel, whiting, parrotfish and wrasse. A new artificial reef continues to be attractive to juvenile fishes probably because of reduced competition for unclaimed territories. Species diversity equals that of a natural reef shortly after establishing the artificial reef site. Daytime observations 7 months after the inauguration revealed greater species diversity on the artificial reef site, mostly dominated by pelagic visitors. An artificial Reef site less than 25m away from the natural site did not diminish the resident population of the natural reef by attracting them to the new habitat. Most of the resident species on the patch reef (????) were recruited to the artificial reef as juveniles. Adult species started using the shelter of the artificial reef soon after its construction. Therefore the fish-biomass on the artificial site increased through the 1st seven months considerably. In general over a 2 year study, both the natural and artificial reef show similar seasonal fluctuations. A well-planed and constructed reef is a mutually beneficial enterprise for both fish and man. The construction of a reef or fish haven can change a barren, relatively unproductive substrate into a dynamic, highly productive environment. Increasing the amount of rough bottom habitat provides immediate shelter and subsequent food for a complex of organisms which may have been otherwise lost to the biota. The results of these studies indicate that artificial reefs also can be used to augment productive natural reefs and rough bottom areas and increase total biomass within a given area without detracting from biomass potential in other areas.